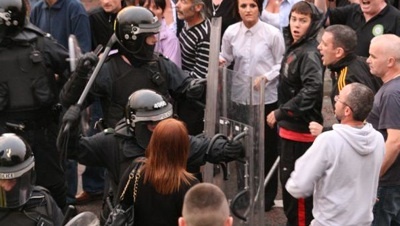 The annual Apprentice Boys’ parade in Derry at the weekend saw a number of acts of deliberate aggression and random violence by the PSNI against nationalist residents. Thousands of members of the Apprentice Boys’ organisation, flute bands and loyalist supporters marched around the city walls overlooking the nationalist Bogside area in an annual act of sectarian triumphalism over the ‘Siege of Derry’ battle in 1689. Despite the absence of any direct confrontation between Protestant marchers and nationalist protestors, PSNI riot squads launched repeated assaults on local residents outside their own homes. One old age pensioner, barely able to walk and requiring the use of crutches, was assaulted and pushed into a PSNI vehicle by riot police. Apparently targeted for wearing an Irish rugby scarf, the arrest of Robert Green was followed by a PSNI baton attack against his neighbours and friends on Fahan Street. In another incident, a child of 14 years of age was left bleeding and severely concussed after PSNI members brutalised him for allegedly kicking their police vehicle. Two PSNI members then sprayed CS gas at residents who ran to his aid, before they bundled the boy into an armoured vehicle. While the parade itself passed largely without incident, local republicans condemned the level of PSNI violence meted down to Derry residents. For many, it recalled a long history of Crown force violence in the city. Fahan Street resident Noel Nash said the PSNI operation was reminiscent of the early 1980s. He said the heavy-handed operation was not commensurate with isolated acts of resistance by local youths. “There was a small minority looking for trouble but it was the way the police treated the young people from the early morning with stopping and searching them and asking them where they were going. “It was like old-time policing. They arrested a man from Fahan Street who has a bad heart for no reason at all. He was not causing any type of confrontation. It reminded me of the police in the early 1980s when they just beat us off the street,” he said. The majority of the arrests took place in Fahan Street after the parade had finished but a small number had been arrested throughout the day. A number of those arrested were loyalists charged with being drunk and disorderly and were later released. The 32 County Sovereignty Movement (32CSM) staged an event in the Bogside at the same time as the march passed through the city centre. Several hundred people attended the anti-internment protest. Before the protest, several leading members of the 32CSM were stopped and searched by police in a local bar and a number of other members were searched in the city centre, including one man who was searched twice in the space of ten minutes in the Diamond area. Speaking at the protest, Martin O’Neill, from the 32CSM, condemned the police operation but said he hoped the day would pass off peacefully. “We hold a protest here one Saturday in every month about what we see as the ongoing internment of republicans. As far as we are concerned, anyone who checks will find that we have been here regularly protesting. “Anyone on the ground can see that what is happening is just the latest in a long line of harassment from the RUC/PSNI,” he said. “Taxi men have been stopped, other motorists have been stopped and several members of the 32 CSM were searched in a local bar while getting a bite to eat,” he said. With summer tourists bewildered and stunned by the police violence, city traders called for an end to the disruption. The chair of the Derry City Centre Initiative, Brendan Duddy, called for the annual parade to be cut in half. “We are going to enter into additional dialogue with the Apprentice Boys about the possibility of having the length of time that they march reduced. Earlier in the day, a so-called ‘feeder parade’ by the Apprentice Boys in north Belfast passed off peacefully despite fears of violence. The PSNI helicopter monitored events in the Ardoyne area on Saturday morning with water cannon, prison vans and dozens of riot police on stand-by as the parade made its way past the north Belfast flashpoint. Up to 100 nationalist residents staged a protest, which had been approved by the Parades Commission. The Republican Network for Unity held a second protest, with members of Eirigi, Republican Sinn Féin and the Irish Republican Socialist Party also present. However, the early morning parade passed off without incident. Nationalist politicians welcomed the absence of violence but warned that future parades without agreement was no longer sustainable. Sinn Féin assembly member Caral Ni Chuilin questioned the need for Apprentice Boys to parade past Ardoyne. “As soon as they march past nationalist homes they get straight on a bus to Derry. “Where is the cultural tradition in that?” she said. Meanwhile, the Parades Commission has imposed no restrictions on an highly inflammatory loyalist march through a County Antrim village on Friday August 21. Restrictions have never been imposed on the march, which involves over forty so-called ‘kick-the-pope’ bands. Sinn Féin’s Daithi McKay complained that it is “absolute madness” to allow a parade to go through a “village which is over 90 per cent Catholic”. “People here are extremely angry that the commission is refusing to tackle the issue of this parade and the intimidation and violence that has come with it in recent years,” he said. Mr McKay said it is “the most contentious parades in the village and one of the most contentious in the north at the moment”. “Not a single business in the village opens during the parade out of fear,” he said. The Rasharkin Residents Association has applied to stage a peaceful protest.